November 30, 2012 Archives - Clarksville Sports Network - Clarksville Tennessee's most trusted source for sports, including Austin Peay State University. ATLANTA — Three years after welcoming Tommy Hanson to the Major League level as baseball’s top pitching prospect, the Braves have created some payroll flexibility by trading the right-hander to the Angels on Friday. 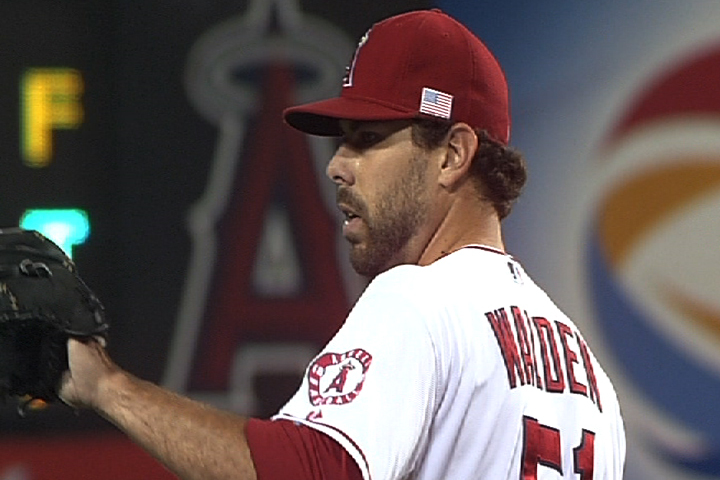 Hanson was traded to the Angels in exchange for right-handed reliever Jordan Walden. By moving Hanson and the approximate $4 million salary he will likely get during his first arbitration-eligible season, the Braves have increased their options as they continue to search for an outfielder who could serve as their leadoff hitter. This move could open the door for the Braves to make a more aggressive pursuit of free-agent outfielder Shane Victorino, who could be targeted to play left field and bat in the leadoff spot. With Julio Teheran and Randall Delgado both ready to fill one of Atlanta’s rotation spots, the Braves were hoping to be able to trade Hanson, who went 13-10 with a 4.48 ERA in 31 starts this past season. The 26-year-old right-hander’s velocity has dropped over the past few seasons, and his mechanics have created cause for concern throughout his career. Walden compiled a 3.46 ERA and recorded 48 strikeouts while issuing 18 walks in 39 innings for the Angels this past season. The 25-year-old hard-throwing right-hander has an overpowering fastball that has been clocked between 98-100 mph. Control and command of his secondary pitches have been a concern. The Crow Community Center�s Indoor Soccer League kicks off January 5. The 8-week league is open to ages 4-12 years and will teach the fundamentals of soccer. Games will be held at the Crow Center, located at 211 Richview Road, every Saturday beginning January 5.� Ages 4-6 will play at 9 a.m., ages 7-9 will play at 10 a.m. and ages 10-12 will play at 11 a.m. each week. Cost to participate is $20 with a community center ID for the entire eight weeks. Participants ages 6 and older must have an ID card to participate. Center ID cards are available for purchase at any of our three community centers as well as the Main Office. Cards are $5 for an entire year and are good at all three centers.� Families with multiple children are eligible for discounted pricing. Registration can be completed at recpro.cityofclarksville.com through January 4. For more details on programs at our Community Centers, please contact the Clarksville Parks and Recreation Office at 645-7476 or visit recpro.cityofclarksville.com. NASHVILLE, Tenn. — The Tennessee Titans and the US Marine Corps Toys for Tots Foundation will once again join forces for Touchdown for Tots, a national toy drive benefiting the Toys for Tots Foundation, during their annual Toys for Tots Stadium Drive.�� The Titans are asking fans to bring a new, unwrapped toy to�LP Field on Sunday, December 2nd when the Titans host the Houston Texans with a 12:00 noon kickoff. Members of the U.S. Marine Corps Reserve will be in uniform and stationed at seven drop-off sites to accept toys from fans starting at 10:00 am when the gates open.� All toys collected during the drive will be donated to Marine Corps Reserve Toys for Tots program.� The Marine Corps Reserve, with the assistance of local social welfare agencies, church groups, and other local community agencies, distribute toys to the neediest children in middle Tennessee.� The Titans encourage all Tennessee residents to participate in their local Toys for Tots area drives to help those in need this holiday season. With 16 million children living in poverty in the United States, the need for Toys for Tots is greater than ever.� Titans fans can get involved by bringing a new, unwrapped toy to the game or go online at www.toysfortots.org� now through December 24th to sponsor a toy for a less fortunate child in their community. For 66 years, the Marine Toys for Tots Foundation has delivered a message of hope to less fortunate children through the gift of a new toy during the holiday season.� Upon the conclusion of the 2011 campaign, Toys for Tots had distributed nearly 16 million toys to more than 7 million children nationwide who might not have otherwise experienced the magic of the Christmas holiday season. The Marine Toys for Tots Foundation is a not for profit organization authorized by the U.S. Marine Corps and the Department of Defense to provide fundraising and other necessary support for the annual Marine Corps Reserve Toys for Tots Program. Now in its 66th year, Toys for Tots provides joy and a message of hope to less fortunate children through the gift of a new toy or book during the holiday season.� Our gifts offer these children hope, recognition, and a positive memory they will cherish for a lifetime. Many of the books, games, and sports equipment that we provide as gifts make a significant contribution to the educational, social and recreational development of these children. The Marine Toys for Tots Foundation relies on individual donations from the American public as well as support from corporate sponsors. For more information, visit www.toysfortots.org. BRENTWOOD, Tenn. � After the completion of the fall sport championships, Eastern Kentucky University leads the 2012-13 Ohio Valley Conference Commissioner�s Cup all-sport trophy standings; the Cup is a symbol of overall athletic excellence in Conference-sponsored championships. It marks the fifth year in a row the Colonels have been on top of the standings following the fall championships. This season EKU was paced by first-place finishes in men�s and women�s cross country, a tie for second in football and a third-place soccer finish. Eastern Kentucky (48.0 total points) has a 2.5-point lead over second-place Eastern Illinois (45.5), who won the OVC football championship and finished second in men�s cross country and third in women�s cross country. Southeast Missouri State is third (44) and followed by OVC newcomer Belmont (37.5). UT Martin is fifth (35.5) and followed by Austin Peay (33), Morehead State (31.5), Jacksonville State (30), Murray State and SIUE (22 apiece), Tennessee State (19) and Tennessee Tech (17). The 2012-13 season marks the fifth for the re-formatted Commissioner�s Cup, which was previously known as the All-Sports Trophy. The award (which started in 1962-63 for men�s sports and 1980-81 for women�s sports) was previously divided into a Men�s All-Sport Champion and a Women�s All-Sport Champion. Points were awarded for each of the 18 sponsored sports and each school was required to count its totals from each sport in its grand total. Beginning in 2008-09 only one trophy was awarded (Murray State won the first honor followed by two-straight wins by Eastern Illinois and then an EKU win a season ago). Schools are required to count point totals for four main sports (football, volleyball, men�s basketball and women�s basketball) along with their next eight highest point totals from the remaining sports, regardless of gender. Belmont, Morehead State and SIUE, which do not compete in OVC football, count baseball as one of its four required sports. Under the old system current leader Eastern Kentucky won 15 Men�s All-Sport Trophies and seven Women�s All-Sport Trophies. Both are all-time bests in each category. The points system for scoring is as follows. For all sports (except rifle, men’s indoor and men’s outdoor track � which have six or fewer participating teams), the first place team earns 12 points, the second place team earns 11 points, etc. For rifle, men’s indoor and men’s outdoor track and field, the first-place team earns 12 points and subsequent point increments are calculated by dividing the total number of OVC member institutions by the number of institutions sponsoring the sport (for rifle that number is 2.75 less, for men�s indoor track that number is 2.0 less and for men�s outdoor track that number is 1.75 less). New to the scoring system last season was a bonus point for the winner of OVC Tournaments (soccer, volleyball, basketball, tennis, softball and baseball). UT Martin earned that bonus point for soccer while Belmont won the bonus point for volleyball. There are 13 OVC Championships remaining this year (rifle, men�s indoor track & field, women�s indoor track & field, men�s basketball, women�s basketball, women�s tennis, men�s tennis, women�s golf, men�s golf, women�s outdoor track & field, men�s outdoor track & field, softball and baseball). Lee Smith hasn’t yet made it into the Hall of Fame. But if Cooperstown has a “green room,” a stand-by parlor until your formal entrance cue, Large Lee made it through those doors last year, his 10th on the Baseball Writers’ Association of America ballot. A year ago, Smith finally became a Hall of Famer-elect. Either that, or he became Gil Hodges — the late first-base great who, through the first 75 years of balloting, remains the only one to ever get more than 50 percent of the votes and never reach the 75 percent required for induction. Smith crossed that promising threshold for the first time last year, at 50.6 percent. Rather than become the next Hodges — who was repeatedly stonewalled in the 50-63.4 percent range between 1971-83 — Smith hopes to become the next Goose Gossage or the next Bruce Sutter, fellow trailblazing closers whose plaques already adorn the Hall of Fame’s walls. The long wait used to puzzle Smith; to an extent, probably still does. But it has also made him appreciate more the privilege of possibly joining baseball’s Valhalla, having given him time to reflect on the company of peers waiting for him. “Just to be mentioned for the Hall, alongside guys like Lou Brock, Steve Carlton, Bob Gibson and so many others. … Man, that’s incredible,” Smith said. In 2003, in his first year of eligibility, the onetime and longtime holder of the career saves record drew 42.3 percent of the votes, and he remained in that respectable zone until cracking the 50-percent ceiling. So, unless voters choose to dismiss one of the modern game’s trendsetters, Smith’s likeness will eventually find its way into Cooperstown’s Plaque Room. Since 1964, only five men have held the career saves record longer than for one fleeting year. Two of them — Hoyt Wilhelm and Rollie Fingers — are already in the Hall of Fame. Two others — Trevor Hoffman and Mariano Rivera — are certain to join them as soon as they become ballot-eligible. Then there is Smith, who held that record from 1993 until being passed by Hoffman in 2006 — three years after he had first landed on the ballot. During Smith’s fruitless candidacy, the perceived cold shoulder to relief pitchers has warmed up with the elections of Dennis Eckersley (in 2004), Sutter (’06) and Gossage (’08). And the man who once seemed destined to be the one to throw open Cooperstown’s doors for closers would be more than thrilled to follow his peers across the door sill. “To see Goose and Rollie and Sutter going in now, that’s going to help us relievers out a whole lot,” Smith has noted. A candidate must receive 75 percent of the vote from BBWAA members to gain election to the National Baseball Hall of Fame. Shortstop Barry Larkin (86.4 percent) was the lone 2012 inductee, while pitcher Jack Morris (66.7 in his 13th year of eligibility) and infielder Jeff Bagwell (56) were the only near-misses to score higher than Smith. Even in the fickle world of Hall of Fame certification, the rejection of Smith, who turns 55 in the first week of December, has been interesting. He was so dominant for so long that, in 1995, he was singled out by the respected columnist Jim Murray as the active player most likely to make it to Cooperstown. As it turned out, 14 others active at that time have beaten Smith through baseball’s pearly gates. If a new trail has indeed been blazed, few belong in the footsteps of Sutter and Gossage more than the 6-foot-6, 240-pound jovial giant whose 478 saves survived as the career record until September 2006. His loss of the all-time mark has been viewed as the leading plank of Smith’s heretofore unsuccessful Hall campaigns. So it would be ironic for him to gain entry without that distinction. Yet, there is no denying the encouraging precedent set in the recent elections of Sutter and Gossage who, incidentally, between them combined for only 132 more saves than Smith alone logged during his 18 seasons. Both Sutter — elected in his 13th year on the ballot — and Gossage — affirmed in his ninth year — began their candidacies with lower support than had Smith. Smith and other closers have been dealt a unique hand by the modern proliferation of their specialty. While perspective tends to raise appreciation for past players’ performances, in the case of closers, each season appears to dilute their accomplishments. Putting up 30 saves just isn’t as big of a deal as it was in 1984, when Smith broke that barrier for the first of 10 times. In ’84, six other big league closers notched 30-plus saves; in a typical season in the current era, that number triples (an average of 17 have accomplished the feat over the past five seasons). And few have done that job as consistently as did the soft-speaking Louisiana native, who went 12 seasons between his first 30-save season and his last (1995). That extended success is also part of Smith’s handicap. He isn’t recalled as an impact reliever. Thus, contemporaries Sutter and Gossage, whose heydays were more concentrated, were widely regarded as more deserving of enshrinement. Smith’s have-hammer-will-travel career keeps him from being identified with any particular team, creating another image problem. He logged saves for eight teams. Yet, until recently, Smith held the career saves record for two of those teams, both among the most storied franchises in the game. He still holds the Cubs’ record of 180, and also had the Cardinals’ mark until Jason Isringhausen notched his 161st save for St. Louis on June 13, 2006. This is noteworthy, also, because those were Sutter’s primary teams as well. For someone who supposedly lacked impact, Smith certainly had his dominant years. During one six-year stretch (1985-90), he averaged more than one strikeout per inning each season, with 580 total punchouts in 509 frames during that span. Gossage, reputed to be the fire-breathing flamethrower of his era, did that in only four of his 23 seasons. Smith supporters love to point out that when he notched his first save, in 1981, the career record was 272, a number he would surpass by more than 200. And that old lifetime mark was held by Fingers, who was recognized for it by being inducted into the Hall of Fame on his second time on the ballot (after a near-miss as a rookie candidate). But Smith presented a compelling argument that lasted 18 seasons, during which he appeared in 1,022 games — most of which ended with him throwing the last pitch. He held another Major League record for most games finished — 802 — until it was surpassed late in the 2009 season by Hoffman, who in ’11 was himself overtaken by Rivera. Considering that Smith either saved or won more than half of the games in which he appeared (549, to be exact), the good comfortably outweighed the bad. Does he have one more good finish in him? That hope was realized by Sutter and Gossage, so one of these years, Lee could be living large, too. There will be a sense of celebration and excitement among Braves fans when the 2014 Hall of Fame class is announced. Greg Maddux, Tom Glavine, Bobby Cox and John Schuerholz could all be among the inductees. But there will also likely be a sense of sadness among fans when the 2013 Hall of Fame class is announced without the inclusion of Dale Murphy. One of the most beloved figures in Braves history, Murphy gained national fame while proving to be one of the game’s most productive players during the 1980s. As he won consecutive National League MVP Awards and multiple Gold Glove Awards, he seemed to be constructing a Hall of Fame career. But to the chagrin of many Braves fans, Murphy is a long shot be elected to the Hall of Fame by the Baseball Writers’ Association of America. This year marks the 15th and final year that he will be on the Hall of Fame ballot. There may have been a short period during the ’80s when Murphy seemed to be a cinch for future Hall of Fame induction. But since being placed on the ballot in 1999, he’s never received more than 24 percent of the votes. Murphy was included on 14.5 percent of the ballots cast last year. That’s 1.9 percentage points higher than he drew the previous year. There is a chance that he could see yet another increase from voters who choose to give him a tip of the cap during his final year on the ballot. But barring a miraculous turn of events, this increase will still leave Murphy far short of the 75 percent vote total players must receive to gain election to the National Baseball Hall of Fame. Shortstop Barry Larkin (86.4 percent) earned his ticket to Cooperstown on the 2012 ballot. Starting pitcher Jack Morris (66.7 percent) and first baseman Jeff Bagwell (56 percent) are the top returning vote-getters from last year’s ballot. Results of the 2013 election will be announced on Jan. 9. Schuerholz, who currently serves as the Braves’ president, campaigned last year for Murphy by sending a letter to Hall of Fame voters and other members of the BBWAA. “The Atlanta Braves organization is extremely proud of Dale’s outstanding accomplishments during an extraordinary 18-year Major League career, 15 of which were spent with the Braves,” Schuerholz said in the letter. Murphy won back-to-back NL MVP Awards in 1982 and ’83, and he stood as just one of six players during the 1980s to record 30 home runs and 30 stolen bases in a season (’83). He won five Gold Glove Awards, four Silver Slugger Awards and earned seven All-Star selections. Murphy’s supporters have continued to point out that he led all Major League outfielders during the 1980s in home runs (308) and RBIs (929). He ranked second among outfielders during this span in hits (1,553) and extra-base hits (596). Murphy compiled more total bases than anybody during the ’80s. Over that 10-year span, Mike Schmidt was the only player with more homers, and Eddie Murray was the only player with more RBIs. Schmidt and Murray have both been enshrined in the Hall of Fame. Murphy’s candidacy has seemingly been hindered by his .265 lifetime batting average, which was damaged during some unproductive years late in his career. He hit .289 from 1982-87, but batted just .238 from 1988 until the end of his career in ’93. After playing for the Braves from 1976-90, Murphy concluded his career by playing with the Phillies (1990-92) and the Rockies (’93).